Bob Hope, Hollywood USO is now open at LAX. Los Angeles, Calif. – Since 1941, around the country and around the world, the USO strengthens America’s military service members by keeping them connected to family, home and country, throughout their service to the nation. 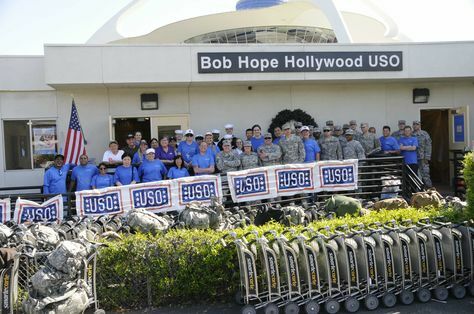 Bob Hope USO is not a government agency and relies entirely on contributions from patriotic Americans and philanthropic corporations and organizations. The Bob Hope USO at LAX is open 24/7, to current members of the military and their dependent families with proper military ID. In recognition of a career spent in the military, we also welcome military retirees, who meet our admission requirements, on a space available basis, between 4 a.m. and 10 p.m. This welcoming “safe haven” for troops and their families is located on the ground floor of the historic LAX Theme Building on Center Way. The 7,100 square foot USO center opened in Summer 2018 and is serviced by nearly 300 volunteers. More than 100,000 troops and their families, visit the Bob Hope USO at LAX annually. Amenities include a canteen snack bar, dining room, large nap room, family zone with play area and three private family rooms with dedicated restroom, three private connection rooms for calling home, big screen TV lounge and movie theater, gaming lounge, charging stations, secure luggage storage and an outdoor pavilion. The center features also features men’s and women’s restrooms and showers, as well as a tribute to famed comedian and USO entertainer, Bob Hope. All services are provided without charge to current military personnel and their dependent families with proper ID. There is no on-site parking available, all guests must park in parking structure 1 or 2. Passenger drop-off and pick-up is available on the outside curb near the front entrance.